It’s like when I was in medical school, they showed us a study. You can create a study such that the study can prove anything. They showed us a study that showed that polio was highly associated with ice cream consumption. So the thought was, maybe ice cream causes polio. The truth is, polio is not caused by ice cream consumption; polio is an infection. But polio is spread during the summer when kids eat more ice cream. If that’s the only question that you ask, “Did you eat ice cream?” and they say yes, then you can kind of construct a study that shows anything. But if you’ve got high blood pressure, your doctor has pills. 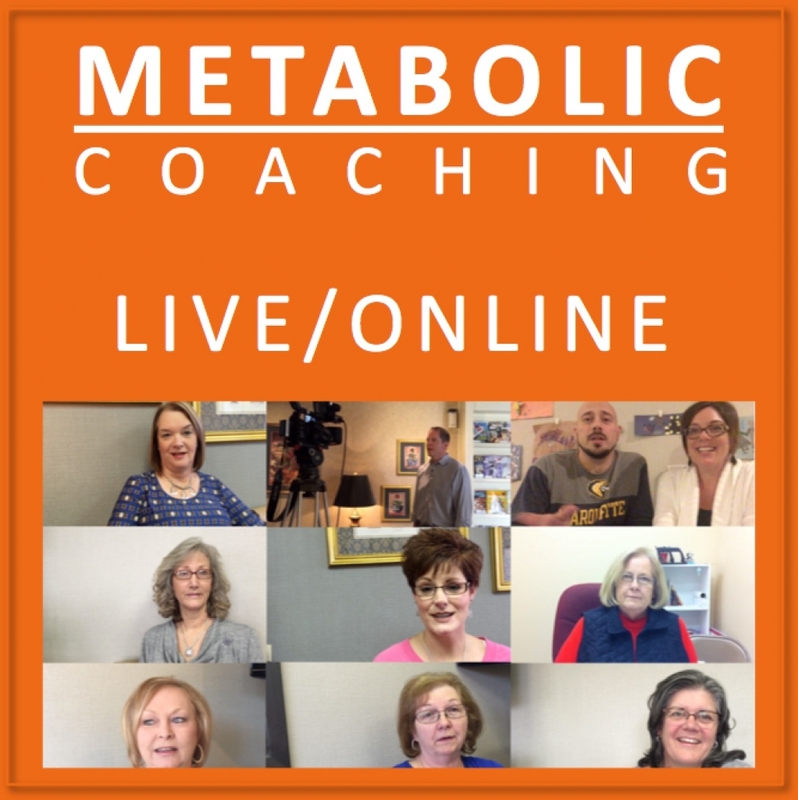 There’s hydrochlorothiazide, Diovan, atenolol, lisinopril, and there are over 200 blood pressure medications, or you can cut the killer carbs. This is my blood pressure again, I’ll show you again: 142 systolic in 2011, 126 in 2013. 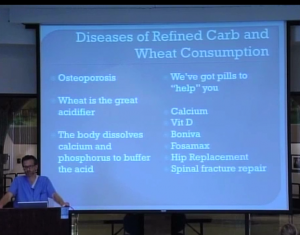 Another disease that comes from refined carbohydrate consumption and especially wheat consumption is osteoporosis. You wonder why all these people have osteoporosis. There’s two reasons: number one, there’s an epidemic of vitamin D deficiency in this country and that’s because we’re eating too many refined carbs and we’re not eating meat. Vitamin D comes from meat. It comes from being in the sun, but it comes from meat. And number two is that when you consume wheat, wheat acidifies the body. Essentially if you’re eating a diet and your diet is meat and vegetables, meat is kind of acidic; vegetables are basic – acid/base. 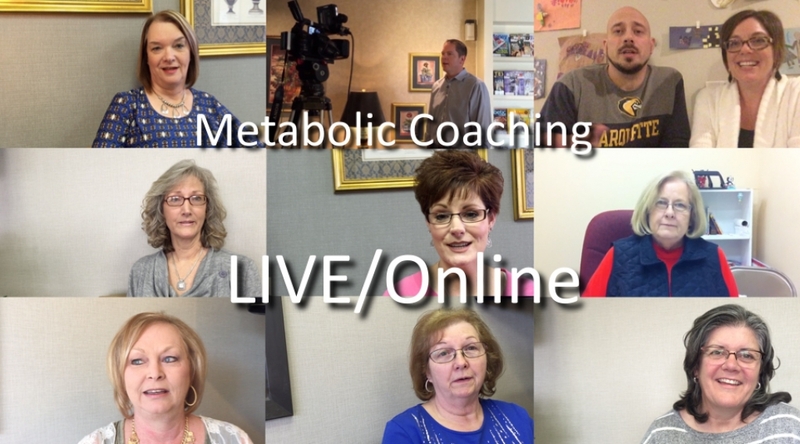 Your body chemistry operates better if it’s just a touch basic. So if your diet is half meat, half vegetables, overall your diet is basic and your body likes that. When you add wheat to the diet, your diet becomes net acid. The end result is you add wheat to a meat and vegetable diet, everything becomes acid. Your body doesn’t function well in an acidic pH, so what does it do? Your diet goes to your bones and it dissolves the calcium and dissolves the phosphate out of your bones to help buffer the acid to bring your pH back to normal. 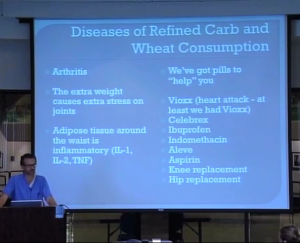 So all these people who have osteoporosis, it can be improved by low carb diet, getting rid of the wheat, or you can take your calcium and your vitamin D, and the once-a-month pill, Boniva, Fosamax, and if you get a fracture you end up with hip replacement or spinal fracture repair or you just cut the killer carbs. Arthritis in the knees is caused by carrying too much weight. If you lose the weight, arthritis in the knees improves. Also, when there’s fat tissue you carry around your belly. And this fat tissue around your belly is uniquely inflammatory. It’s like a big organ or a big gland that releases inflammatory cytokines – they’re called cytokines – little inflammatory mediators in your blood system. And that fat tissue around your belly, when it releases those things, those inflammatory mediators, they get into your joints. They make your arthritis worse. But from a medical perspective, your doctor has pills like Vioxx, which they took off the market because they gave people too many heart attacks – or we used to have Vioxx I guess. There’s Vioxx and Celebrex, ibuprofen, indomethacin and Aleve, and eventually, knee replacement for arthritis, you could have hip replacement for arthritis, or you can cut the killer carbs. Heart disease, we’ve talked about this before. Small, dense LDL is bad, and killer carbs cause that. Low HDL is bad and killer carbs cause that. And high triglycerides, the killer carbs cause that. And if you have bad cholesterol, then there are a whole list of pills that you can take: simvastatin, lovastatin, Lipitor, Zocor, Crestor, aspirin, high-dose niacin. And if things get really bad, they’ll do an angiogram and they’ll do a stent for you. And if they get really really bad, they crack your chest open and they bypass all your arteries. Or you can cut the killer carbs. I want to tell you what I’m saying and what I’m not saying. I’m not saying that if you cut these killer carbs out of your diet, everything’s gonna be perfect, that you’re never gonna have a medical problem, you’re never gonna have a heart attack. But I’m telling you that if you cut the killer carbs out, you’re gonna take less pills, you’re gonna take less medicine, you’re gonna feel better, and you’re gonna lose weight. It won’t make you perfect, but it should improve your health. And there are a bunch of inflammatory diseases, either of the bowel or inflammatory diseases in other parts of the body that are improved when you cut the carb and you cut wheat consumption. 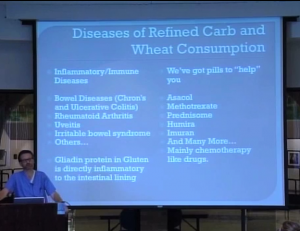 Wheat is uniquely inflammatory, it has gliadin proteins which are found in gluten and the gliadin proteins that are found in gluten, they’re irritating to the stomach, they’re irritating to the bowels, and they’re also inflammatory in the rest of your body. And so she was on three medications at the time, about to have an ostomy, and she got off two of her medications and got down to one and then she eventually dumped her last medication just by getting rid of the wheat. And she did not have to have an ostomy, she still has her colon.